This was a ‘meme’ someone posted this morning and the responses were numerous. They ranged from Jeremiah 10 and the cutting down of a tree (the commandments say that we’re not to even make images of creation so fake ones still fall into that category) to the roots being pagan. A few days ago I received a song via Messenger from someone who was reminding people WHOSE birthday it really is. This all goes back to the battle of putting Christ back in Christmas and I wonder all the time if he ever was really in the Christmas from its inception, and if so, in what capacity. So what does Christmas mean to me? I was raised with a mom who had attended Bible college and made Christmas totally about the birth of Christ. We had trinkets that we put onto a felt Advent Tree every night before we went to bed. We were taught that Christmas was the birth of Jesus and we lived out the holiday to that end. We were involved in our Lutheran church singing in choirs, playing handbells and even recorders. Christmas eve services were so beautiful when thousands who never came to church packed the sanctuary and with lit candles sang, “Silent Night.” I embraced that belief system wholeheartedly because from an early age I had embraced God and Jesus wholeheartedly. I loved God and prayed to Him all the time. 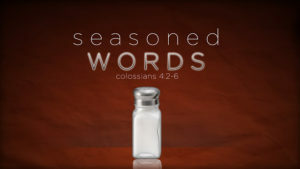 I loved His Word and learned Scriptures without ever attending AWANA or preparing for Bible Bees. Because of my child-like faith, I always had questions about why, if my Bible was filled with accounts of Jewish people and Israel, there were no Jews in my church. My dad worked for Jewish people and we always took his boss a Christmas turkey because ‘they didn’t eat ham.’ Of course, my dad couldn’t explain why so I just ‘knew’ Jews didn’t eat ham, but never considered they also didn’t celebrate ChristMass?! I was also taught by my mom, strangely enough, that someone cannot be both a Christian and Jew or be a Jew who believes in Jesus. That never sat right with me because I read my Bible and knew it was written by Jewish people, prophets of Israel and the disciples who were all Jewish. The Bible taught me about the greatest Jew I ever knew – Jesus. Then, of course, as I read the New Testament, I learned from the disciples about the greatest Jew who ever lived – the Messiah of Israel, Jesus. My questioning went on through high school and college until God took me to a Messianic Jewish synagogue. It was there that I heard a Messianic Jewish Rabbi say, “I am not catholic so I don’t celebrate the Christ Mass.” It was such a simple statement, but such a profound one that I had to look up what a Christ Mass was because I was not catholic either. Remember Martin Luther distanced himself from catholicism (not far enough) and from him was birthed the Lutheran denomination. He eventually became one of the most rabid anti-semitic church fathers, but that’s another story. When I learned the truth about the ‘mass’ being a ‘death sacrifice,’ I was shocked. I had already observed that Jesus was still on the crucifix in catholicism – no wonder my catholic friends were always going to the priest to confess their sins and to mass because their hope was not in Jesus’ resurrected life, but steeped in his death. Oh, ask any catholic what a ‘mass’ is and they can tell you that it does mean ‘death sacrifice.’ Thus, the Christ Mass is nothing more than a memorial to the ‘death sacrifice’ of Jesus while being sold to the world as the day of his birth. Of course, his death is important because through his blood we receive forgiveness of sin and restoration back to God, but this holiday is not being celebrated during the season of Passover when he actually did die on the cross and was resurrected three days later. From this point in my life, I began to question everything that I did in the church setting. Where were its roots? Were they like Sha’ul taught – rooted in the holy things of God or unholy things of the nations? As I studied honestly, I learned that everything churchy was rooted in unholiness. According to Sha’ul in Romans 11, the roots of the faith are very important for the Body of Messiah because from holy roots come holy branches; from unholy roots come unholy branches. He warned the Romans about becoming arrogant over the Jewish people from whom comes salvation, Yeshua. 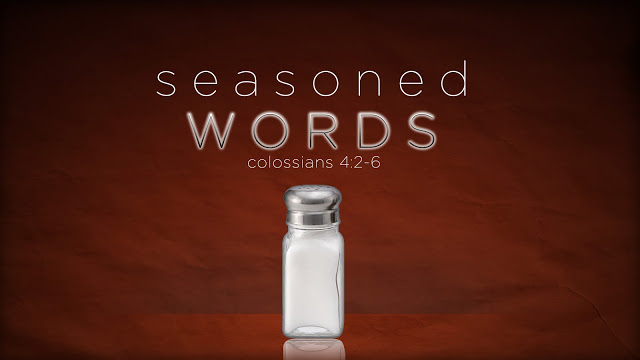 Yet, the Romans continued in their arrogance, including ignorance through keeping the Scriptures from ordinary people, and effectively separated the Truth from an unholy lie until the branches of lies are so thick that rationalizations are made for each individual lie. The prophet Isaiah says “Many nations will go and say, “Come, let’s go up to the mountain of Adonai, to the house of the God of Ya‘akov! He will teach us about his ways, and we will walk in his paths.” For out of Tziyon will go forth Torah, the word of Adonai from Yerushalayim” (Isaiah 2:-3). In essence as I read these words over and over, I was not going to the mountain of the LORD to learn about His ways and to walk in His paths. I was going to Rome, to the Vatican. That realization actually convicted my heart deeply. It is not out of Rome that the Torah of God is taught nor does the Word of the LORD come from the Vatican. It comes out of Tzion and Jerusalem. I had to choose a path for my life: continue embracing the things of Rome and the vain imaginings of the Pope’s divine calling or come out from among them and embrace the holy days of the LORD coming out of Tzion and Jerusalem and the divinity of Yeshua (2 Corinthians 6:17-7:1). Though the choice was easy, the tearing away of warm fuzzies and cherished traditions was not and took several years. Christmas is more than cutting down a tree and decorating it as spoken by Jeremiah. It is more than the materialism that has transfixed western cultures and made everyone selfish and covetous. It is more than the heart-warming carols being sung that may or may not have a truthful Biblical message. It is more than having to separate oneself from friends and even family. It is ‘counting the cost’ of our faith. Each of us must choose to live out the new covenant with a circumcised heart as prophesied by Jeremiah with the power of the Spirit or remain stuck on the ‘crucifix’ and the idolatrous ways of the catholic church. We must choose obedience to God’s Word and His commands over the traditions of men that effectively nullify His commands (Mark 7:13). As Peter and the apostles said, “We must obey God, not men” (Acts 5:29). Today, Christmas means nothing to me. It is not part of my walk of faith because it is not the birth of Jesus. It is rooted in a catholic mass and I have never been nor ever will be catholic. And, neither will my Savior, Yeshua, the Jewish Messiah. 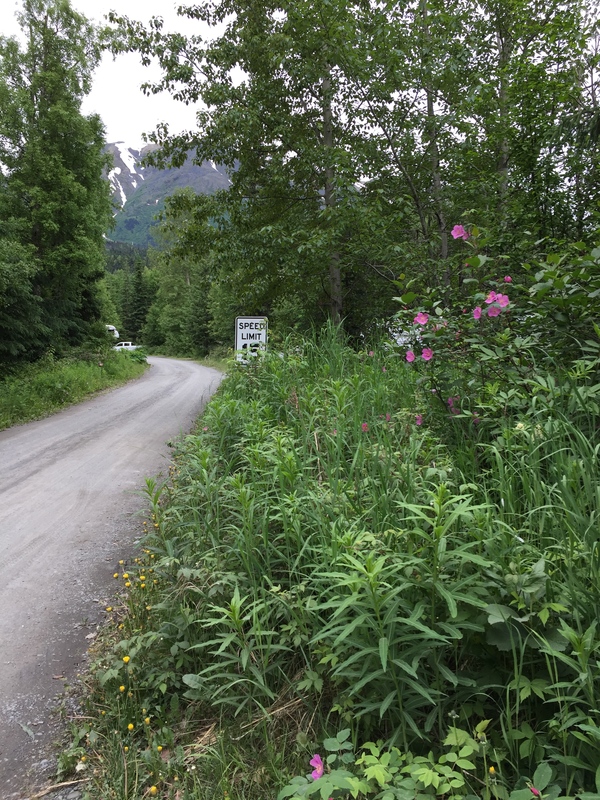 This is our second year campground hosting at Cooper Creek campground on the Kenai Peninsula. I have been calling us ‘sophmores’ or ‘wise fools’. Freshman year we learned the ropes of running our ‘own’ campground, sophmore year, we are learning there are always new things to learn and see with regard to campers and their shenanigans. Last year our biggest problem was guests leaving salmon everywhere, filleting salmon on the old wooden picnic tables, leaving their coolers sitting out full of salmon or just plain salmon problems. It also meant that people were catching a lot of fish and we were blessed by so many campers with salmon that I rarely ate anything else. Wild-caught fresh salmon (20 minutes or so old) is to die for. Several people this year have also blessed us with salmon and even fresh halibut. Why is salmon such a problem? We are in BEAR country. Though what makes you stronger may not kill you, a BEAR will kill you. Just last weekend I had a guest who had been attacked by a grizzly three years ago. 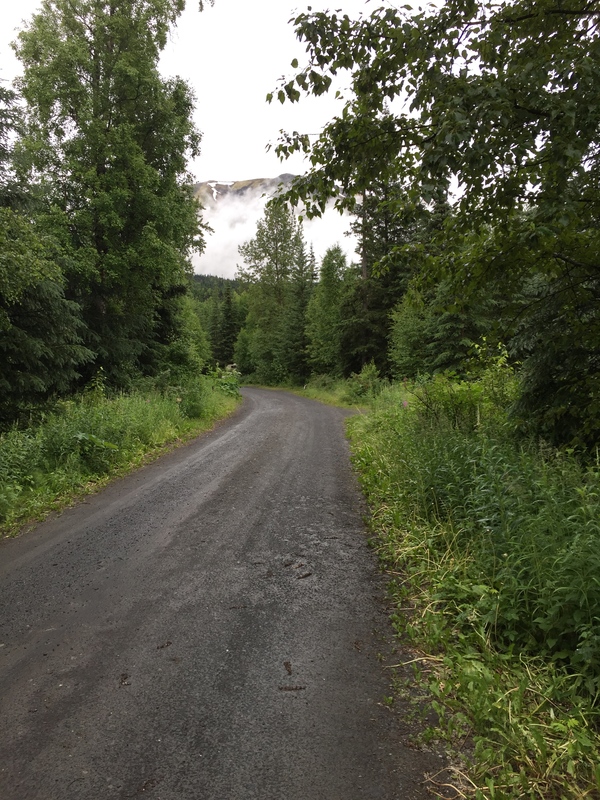 She had been hiking along the Skilak Lake lower trail (we did this last year) and the grass was tall, the river high. Though she and her two dogs wore bear bells, the sound of the river drowned them out. They surprised a grizzly sleeping in the grass. She is an Alaskan and was prepared, but fear took over. She stepped backwards, tripped and fell. The bear picked her up by the leg and threw her on the ground several times; she doesn’t remember too much as she passed out. 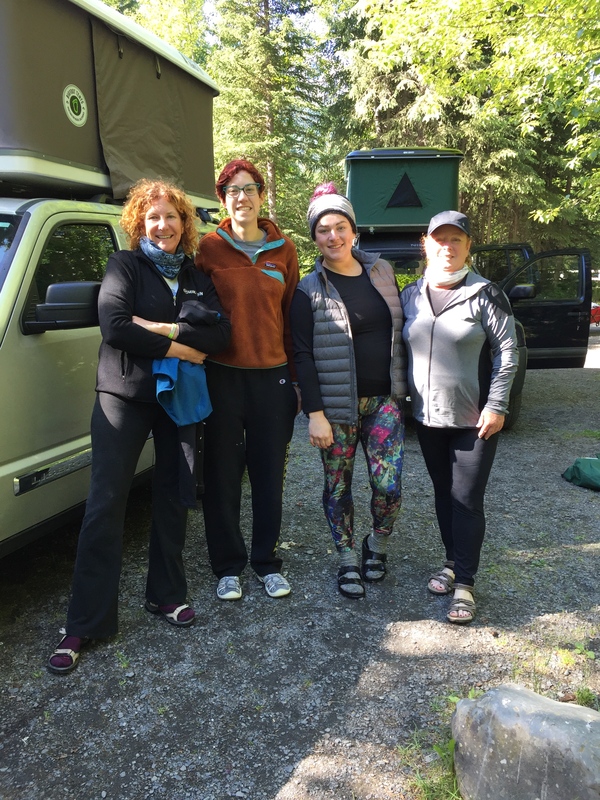 When she woke up, she was by the river and just rolled into the frigid Kenai river which saved her from any more blood loss. One of her dogs was missing, the other one she attached his leash to her backpack and he pulled her 1 1/2 miles to the trailhead where she was able to get help. Several days later her other dog was found seemingly fine until she got sick and they found she had internal injuries, probably from fighting the bear to save the woman’s life. Apart from reminding guests about bears, this year it seems our biggest problem is tree cutting. Imagine being in a forest service campground and going into a campsite to greet guests and there’s a 15-foot tree lying either near or in the fire pit! Really? First, GREEN wood doesn’t burn and secondly, it is illegal in a US Forest to cut anything GREEN. I had to tell that to a BLM employee who thought he could do whatever he wanted in our campground including stripping branches to make marshmallow sticks – also illegal. He challenged me to show him the law which was hanging on the very board where he bought his permit to camp. So, now I have to remind EVERY camper not to cut trees or strip green branches to make marshmallow sticks. After talking with some forest service law enforcement, our best friends and backups, I learned an interesting ‘fact’. The US Forest Service is committed to protecting the forests while the Bureau of Land Management is committed to abusing the forests. Now I know and you do too. July arrived hot, hot, hot. When I say hot, it was about 80 degrees but feels like a humid 90. For the peninsula, this is HOT. Trust me, it’s HOT! Last year we never reached 70 and that felt HOT! Those few days last year were a blessing in the midst of a very rainy summer. This year we have had mostly sunny days until now. Hence why I can take some time to update our adventure. It is supposed to rain the next 10 days and has been raining for the last 4. 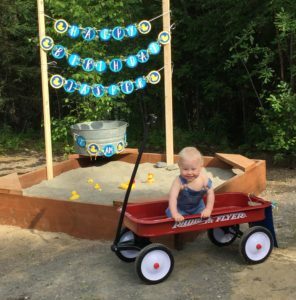 July also brought my grandson’s first birthday which is why we host in Alaska. 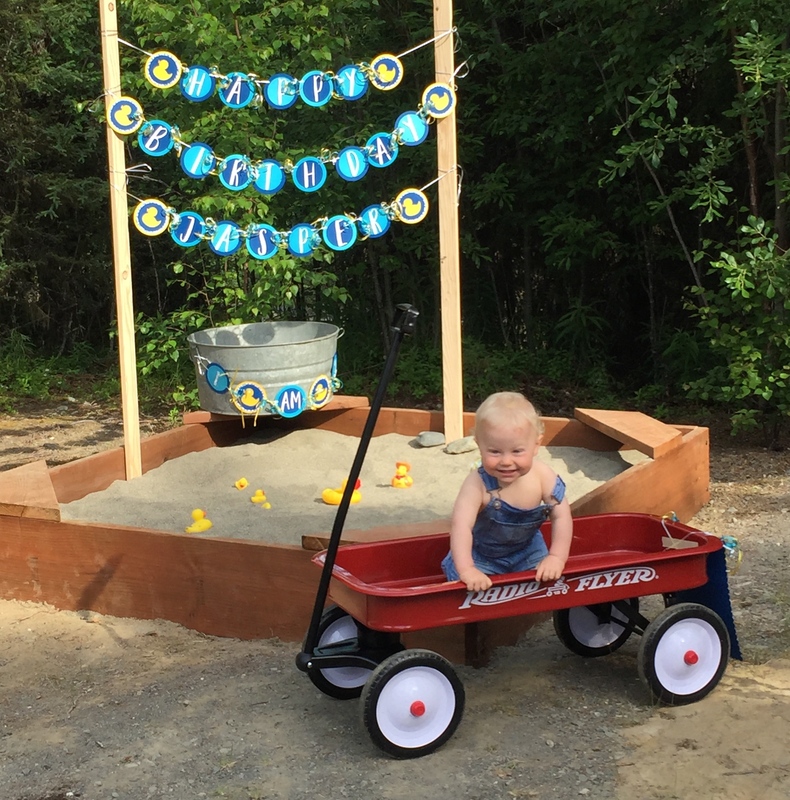 He lives here with his mommy (our daughter) and his daddy (our son-in-law) in a log house with a dog named Max and now has a sandbox! He loves to come to our campground and either rides or pushes the wagon I use to tidy up sites. He loves being in our trailer as I made a zone for him with toys and books. He loves to eat rocks, wave to guests, and meet other children. July is also exhaustion month. We arrive May 3, but we begin working May 15. Until Memorial Day weekend, we have few campers and prepare for our first big weekend. Again, like last year with the rain, it was slow. 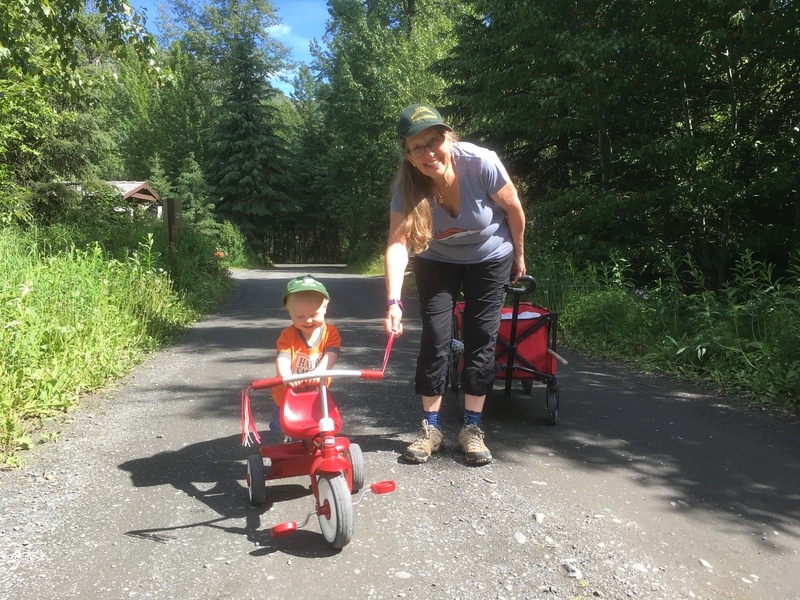 During the first few weeks, we hike and spend time with family. Then, June 11 arrives. 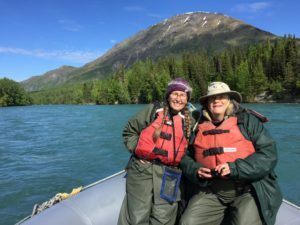 Fishing season opens on the Russian River which is about 2 miles down from us on the Kenai River. We are considered ‘overflow’ from the Russian River Campground which has a stay limit of three days. From July 11 until about August 1, we are non-stop and I mean non-stop between fish runs and dip netting for natives. From the moment our eyes open in the morning until we drop about 11 p.m. at night, we are working hard. Remember, it stays light in Alaska until 1 p.m. at the solstice! We have to put “Office Hours” on our trailer or people would knock on our door 24-7. 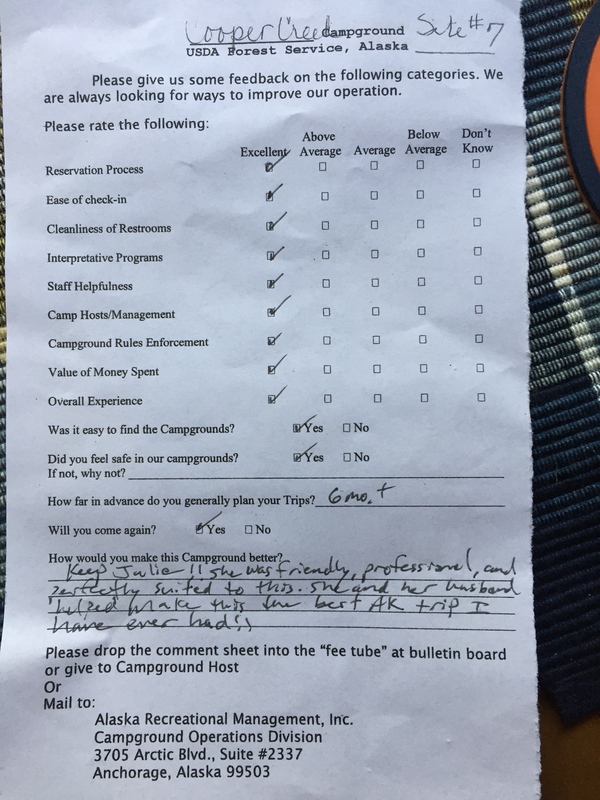 We work for Alaska Recreational Management running our own campground with a lot of freedom. We dry camp all summer hauling water, hauling our waste, and running a generator while managing and hosting about 100 campers per night (a smaller campground). I have really learned that hosting and managing are two different positions, both of which we perform. Hosting is easy. “Hi, how are you, where are you from, what are your plans while you are here?” Managing is more complicated. “You need two nights and there’s only one? You need a bigger site and I’m booked solid? Let’s see if we can trade you with this site for another site? Your friends are coming in, do I have anything for them too? Did you pay for last night? Where is your permit as it should be on your campsite post? Why are you in this site when it has a reserved sign?” And, we have paper work. Everyday I have to submit a daily sheet that lists the permit numbers of every filled or reserved site, the license plate number, where the guests are from, number of days paid, number of days stayed, the amount paid. My wonderful oldest son helped me this year with a spreadsheet as last year I had to hand input repetitive days on every sheet. And, my other younger son bought me an iPad so I can welcome and check-in guests on the spreadsheet as I meet and greet them. The South side of the campground has 21 reservable sites. This is the part of the campground I host and manage. The North Side is by the Kenai River and has 7 walk-in non-reservable sites. My husband manages that side as they are our ‘problem children’ most of the time. 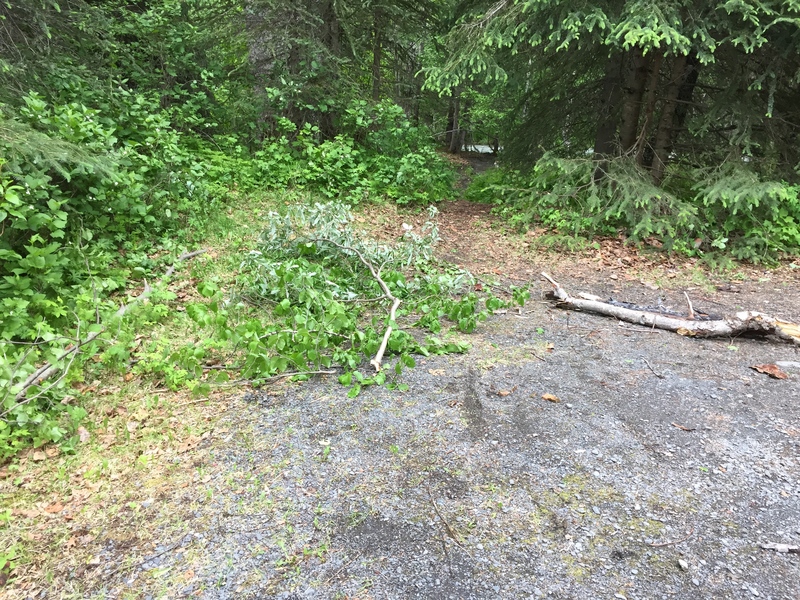 This past weekend one of those campers decided they didn’t want to pay for wood so they ravaged all of our other sites ‘stealing’ wood left behind for those campers who would eventually have that spot! For those of you who camp and see a checkout time, be kind to your hosts and checkout before or at least by that time. What many people don’t realize is that we only have a few hours everyday when we can actually leave the campground and enjoy Alaska or just do laundry and grocery shop. Some days I never see the river and it’s only 100 yards away! Together, we have created a motto for our work: Done by 1, have some fun; Back by 5, keep campers alive! *The Kenai River is ALWAYS that color of turquoise. When the glaciers melt they are full of silt. As the water enters the Kenai Lake, the silt falls to the bottom leaving only the minerals suspended in the water. It is the most beautiful river I have ever seen. 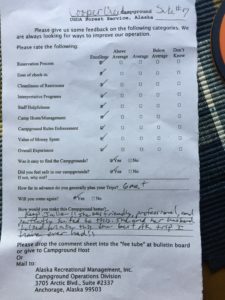 Along with managing and hosting, we are responsible for cleaning toilets, tidying up campsites by cleaning out the fire pit that is used for everything from cigarette butts to broken glass beer bottles, raking the site when needed, and unfortunately, cleaning up dog poop whose owners neglect that part of their responsibility. We check bear boxes for items campers left behind; some campers leave things with us like coolers, stoves, or food they can’t take with them on an airplane. We also weed whack, hang signs reminding people of the rules, and keep our eyes open for squatters who steal campsites or refuse to pay. One of the greatest rewards to this ‘job’ is the people we meet. Without them (and family) this would truly be a thankless job. 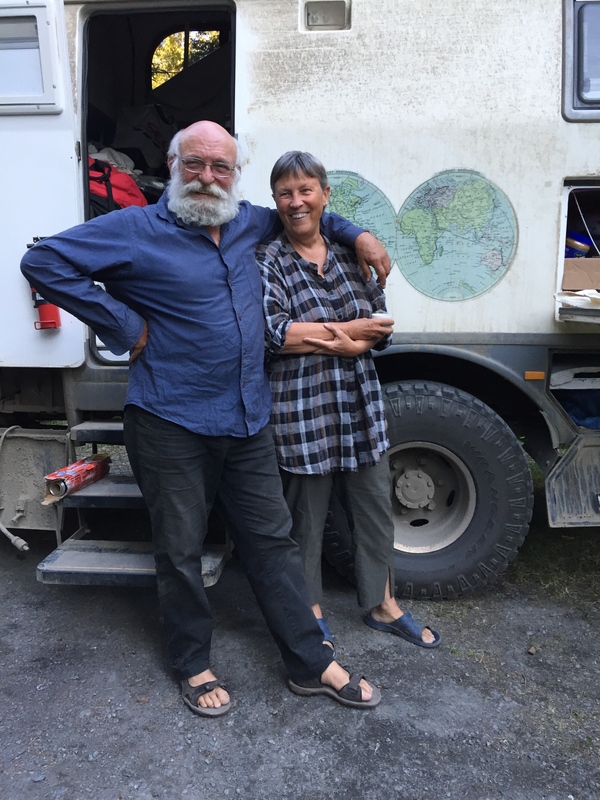 Recently, we had guests from Australia who are traveling the world. I had a little problem with some guests’ payment (they paid too much) and when I went to talk with them, they were from Switzerland and gave me a Swiss chocolate bar. There is a Baptist church group of men who fish together and are here nearly every weekend so we have been able to share our Messianic faith walk with each of them after they see our Shabbat Shalom sign. 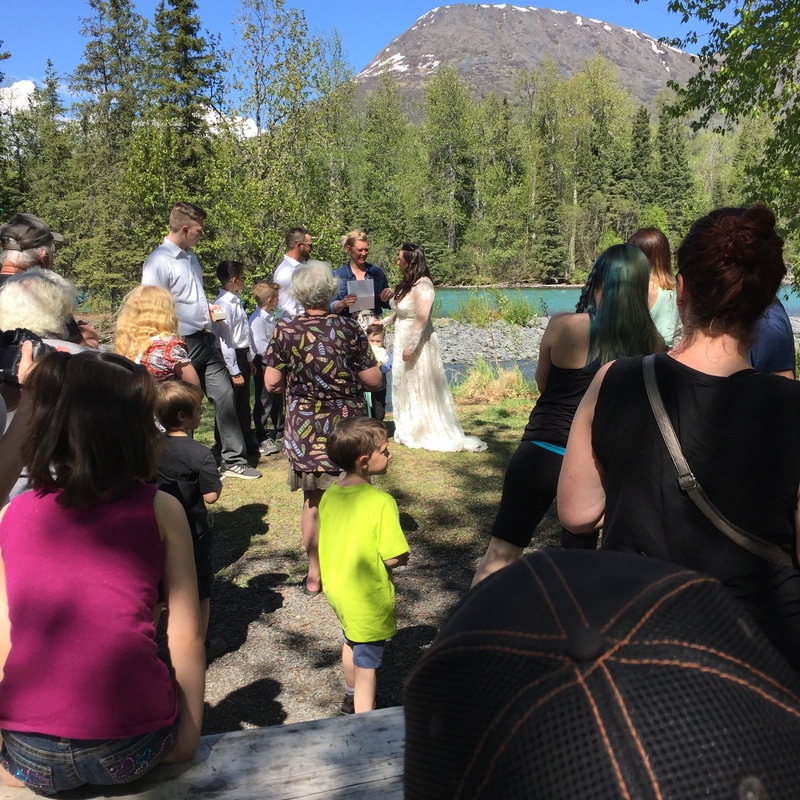 We had a wedding ceremony by the Kenai and a reception in Site 10 celebrating Nate and Crystal. 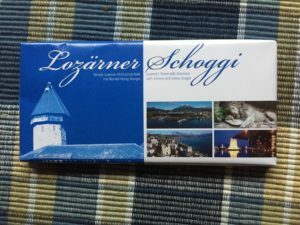 I had an Inner Court dancing friend visit from Colorado. 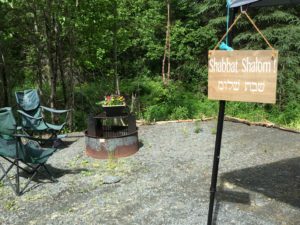 We have had Israelis along with many Europeans and even some crazy women who decided to jet ski out of Whittier to see the glaciers! Their next stop was a fly-out to a glacier for dog sledding! At the moment, we have guests in the campground from York, PA where most of my mom’s family still lives. Hi Keith! Just now I received a text message from some guests who went to a creperie in Seward that we recommended! We enjoyed these fabulous four and spent our Erev Shabbat with them. Two of them will be back in the ‘hood’ next week. Such is the life of a campground host in July. Right now we’re slower because we’re between fish runs. It has also been raining. I’ve been reading a lot of books as I made a Cooper Creek Library book bin: Take One, Leave One. Today we’ll be checking out a few of the other campgrounds in the area so we can give better information to our campers who are on vacation. I started this blog post today with the intention of saying ‘thank you’ to all of the campers who stayed with us this past weekend. Our dumpster was full to the top with trash and there was no pick up until yesterday. We asked each camper/campsite to either haul out their trash or take it to the other side and put it in that dumpster. Saturday night my husband I discussed where and how much trash we would find because people would be lazy, stupid or just not care about what we asked. We expected bear boxes to be full, the bags in the toilets to be full or just bags set by the dumpster welcoming every bear on the peninsula. We found NOTHING! Absolutely NOTHING! Every camper this past weekend took their trash with them out of the campground. I was astounded and my faith in humanity was somewhat restored by these people who were here from all over the world. Thank you! In the area of Cooper Landing are three campgrounds managed by Alaska Recreational Management. Russian River is about 3 miles south and butts the Russian River where the infamous ‘combat fishing’ takes place at the confluence between the Kenai River and the Russian. This is where the first-run of Red, Coho and Sockey Salmon begins on and around June 11. For those ‘in the know,’ this time of fishing is anything but ‘relaxing’ and the fish are plentiful. Generally there’s a three-fish limit per 24-hour period, but last year that was raised to six. 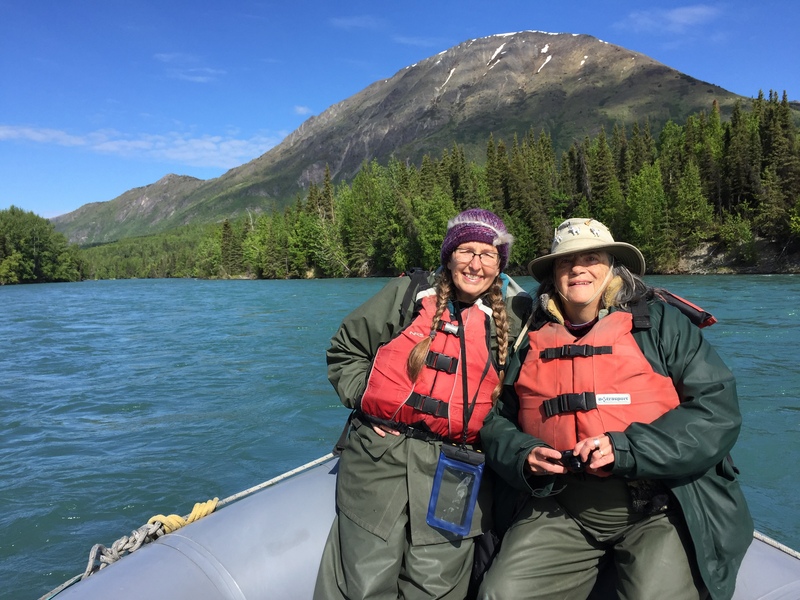 The second run of fish comes in mid-July and goes further up the Kenai. There is always catch and release trout fishing and Dolly Varden (a type of trout). The season actually begins further down river with King Salmon. There is also the world-famous Halibut fishing 3 hours south of Cooper Landing at Homer. 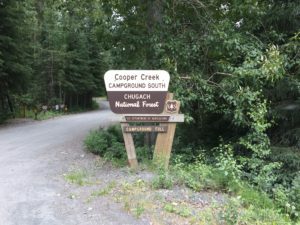 The second campground is at the north end of Cooper Landing known as Quartz Creek. 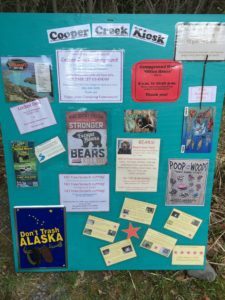 This campground sits on the Kenai Lake and about 10 of the 45 sites open late April, early May depending on snow. This is where we initially ‘land’ when we arrive at Cooper Landing. 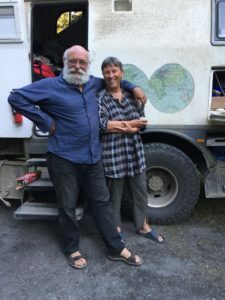 ARM allows us to use electric and water from the host site which is extremely nice especially in colder weather when we are able to run our fireplace and keep the trailer a toasty 68 degrees. 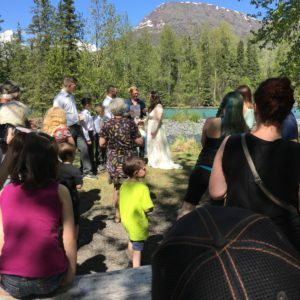 Quartz Creek is where we wanted to host because of the amenities, but we have learned it has a multitude of duties that we don’t have where we host. They have a public boat launch onto the lake along with public rest rooms, they have a pavilion to maintain, they collect trash from the bins to put into the dumpster, they have 45 sites (15 more than we do) and they are responsible for maintaining the dump station. Boondocking looks good from that vantage point. For those who believe campground hosting is ‘glamorous,’ I’ve come to tell you there are parts that are not! We stayed at Quartz Creek until we got permission to enter ours, Cooper Creek. This campground is more primitive than Quartz and is located south of Cooper Landing. ‘Our’ campground as 29 sites, one is ours, on two sides of the Sterling Highway. 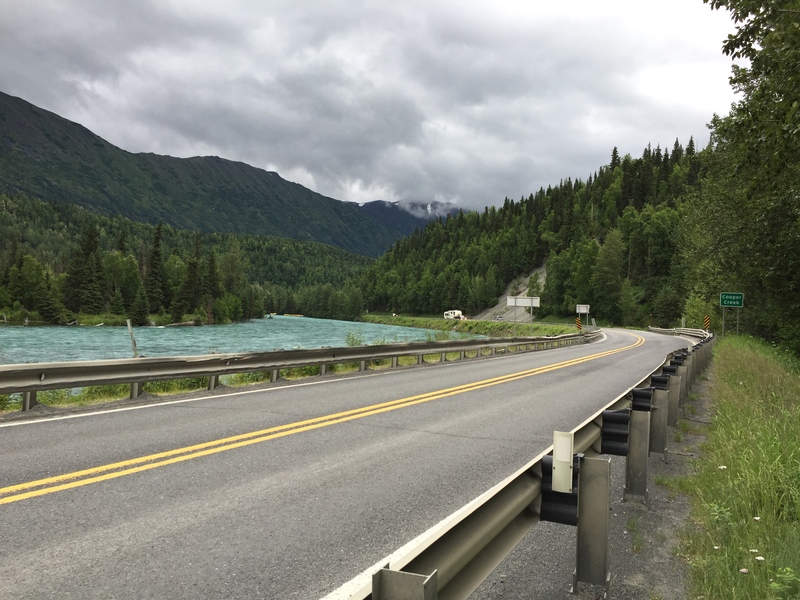 This highway is the major route to Soldotna (about 1 hour away) where we will be doing our shopping and to Homer (about 3 hours away). 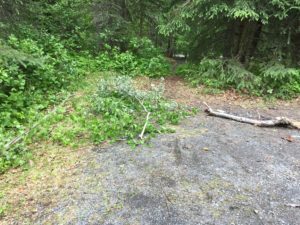 We were quite happy to see that all the work we had done last fall when closing the campground down remained ‘perfect’ on the south or mountain side where we stay. The north or river side also opens early if there is no snow and we definitely have some clean up to do. It seems some trees were cut down by the forest service and they didn’t remove the debris; it also appears some beavers had fun this winter removing numerous trees, leaving not only the telltale signs of the stumps, but also the trees! Don’t beavers use the trees for their lodges? Or, do they just cut them down to sharpen their teeth? On the mountain side, our ‘home’ side runs Cooper Creek. Trout and Dolly Varden may be fished there, but because of some manmade issues, the fish left the creek. The short story is many years ago the salmon returned to Cooper Creek to spawn. A dam was built up top by Cooper Lake to divert water for a power plant. This changed the temperature of the creek by four degrees, only four, but it was enough that the salmon couldn’t find their way. A diversion pipe was put on Cooper Lake to siphon the top warmer water off back into the creek in order to raise the temperature. Fish and Game now study the effects and are seeing that there is some restoration happening. On the river side is the Kenai River and its aquamarine luster. We have 7 non-reservable sites on the river that all have access to the river and fishing. This is where we see most of the wildlife from eagles to moose and we’ve heard about bear sightings; thus far we haven’t been blessed with that wildlife! Alaska River Adventures, our son-in-law’s fishing company offers not only guided fly-fishing trips down this river, but also morning, afternoon, and evening scenic float trips when wildlife can be seen along the banks. As I mentioned, our campground, Cooper Creek, is primitive. We have no electricity or running water though there is a well pump. We have two pit toilets, one on the river side an the other on our mountain side. We ‘boondock’ all summer or ‘dry camp’. This means we haul our water from a spring or other source, use both a gas and solar generator to recharge our batteries, and haul our waste in a wagon-like hauler to the manhole of the pit toilet. Fun? Not really, but it makes the job possible and all of the processes become routine until it becomes fun! We know how to conserve water both in washing dishes and showering, we use the pit toilets so the black-water job isn’t often (about every 2 weeks) and we have puck battery lights everywhere in the trailer so we don’t live in the dark even with nearly 20 hours of light. We have a propane stove, hot water heater and furnace though we use our Mr. Heater more often than not. We spent Mother’s Day morning dumping our black water at Quartz, moving on down the road a bit, and setting up our little ‘home’ for the next four months. 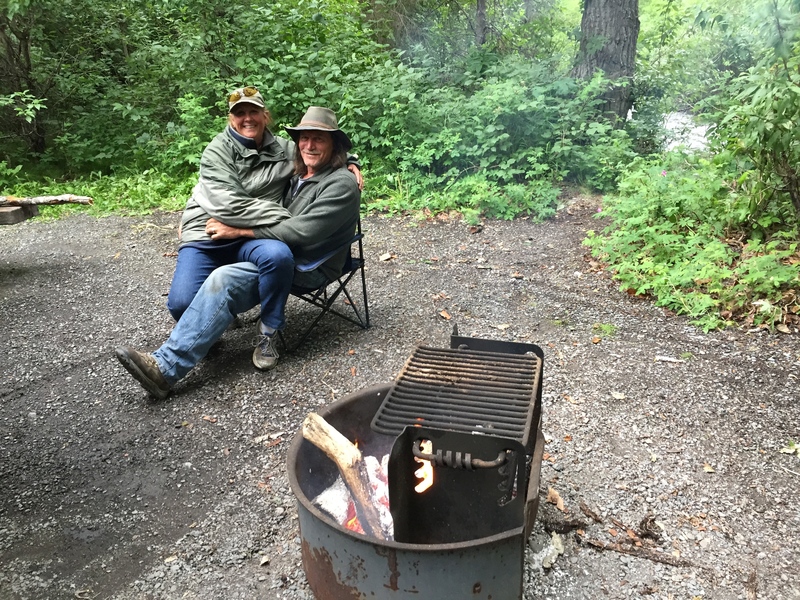 Tomorrow we begin our second year of campground hosting on the Kenai Peninsula. The gate is still closed and we are not open to the public so I’m saying that we live in a gated community where we’re the only ones living, for now anyway. By Memorial Day weekend we will have reservations that don’t stop until Labor Day. From June 11 to mid-August, we are booked and busy 24/7. 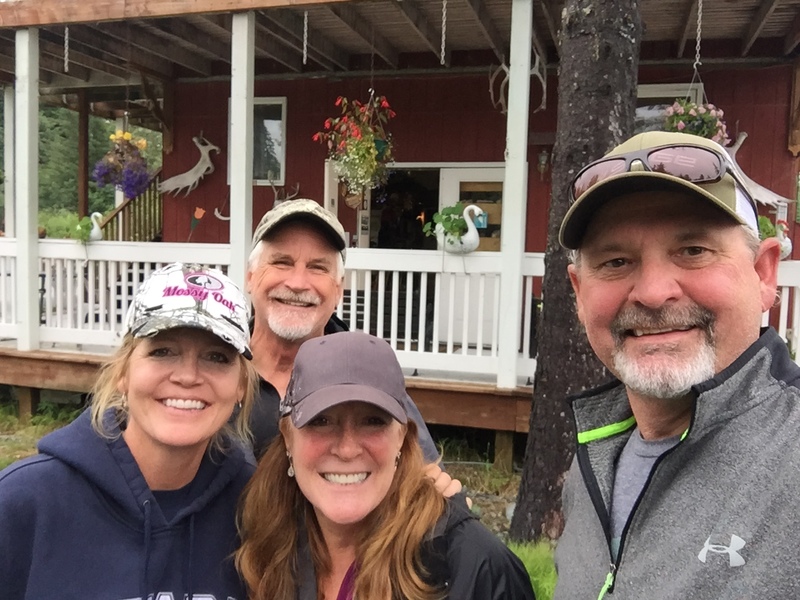 We will meet people from all over the world as well as nearby communities; people who love to ‘get away’ from Anchorage and fish. 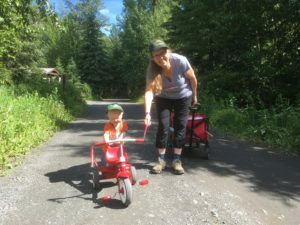 We will eat pizza at Sacketts right next to the campground, enjoy scoops of ice cream at Wildmans, hike some difficult and easy trails, pick blueberries, bake Alaska sourdough bread, watch the salmon swim upstream, remind people of bears and best of all, spend the next four months with our every-growing grandson – the real reason to campground host in Alaska! You are currently browsing the Tentstake Ministries blog archives for the year 2018.